I don't know what it is, but I always find it so interesting to read about people's daily routines, especially in college. It varies so much semester to semester for everyone, but seeing how people spend their day always inspires me in one way or another. 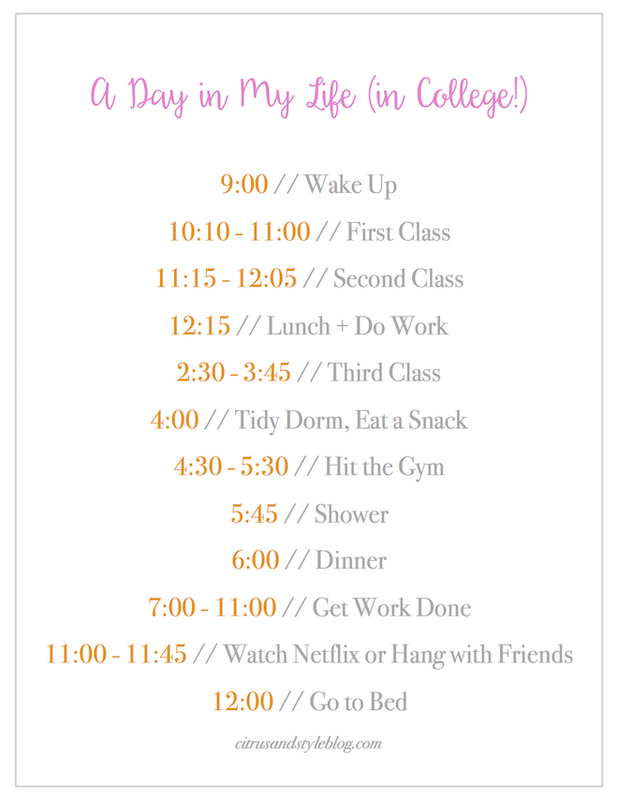 So, I decided to put together a typical day in my college life for you! (I also think it will be fun to look back a few years, or even months, from now and remember what my life was like as a freshman!) My schedule changes a little every day, but this is generally what a Monday or Wednesday looks like for me. After suffering through my least favorite class at 8 am first semester, I realized that getting to sleep in a little bit later in the day is something I really needed. It has been so much nicer getting those extra two hours (although ideally I wish all my classes started at 9:30 every day instead of 10 and 11:15!). Is your college daily routine similar? Love peeking into your day to day life- so fun and makes me so excited for college this fall! I had an 8am four days a week last semester! I am a freshman so I thought I could handle the mornings, but I found out after sleeping through my Geology class all the time. 8ams should be a crime! I agree with you so much. Reading others' schedules who are in the same boat as you really helps you see where you are lacking. Really liked your article.